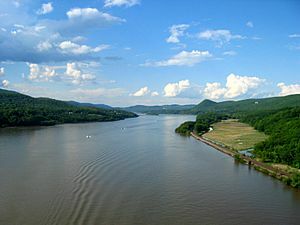 The Hudson River is in the State of New York in the United States. It is about 315 miles (507 km) long. The river runs from Lake Tear of the Clouds near Mount Marcy in Essex County in the north part of the state to New York Harbor in New York City at the south part of the state. It is named for Henry Hudson. The Hudson River is a special kind of river called an estuary. There is some salt in the water from New York City north until Poughkeepsie. It is then fresh water from Poughkeepsie north until Lake Tear of the Clouds. The border for the salt in the water moves when the tide rises and falls. The Hudson is part of the Erie Canal from New York City to Albany. The Hudson River used to have a lot of pollution from industry, but it is becoming cleaner now. The lower part of this river separates New York from New Jersey and is sometimes called the North River. Hudson River estuary waterways around New York City: 1. Hudson River, 2. East River, 3. Long Island Sound, 4. Newark Bay, 5. Upper New York Bay, 6. Lower New York Bay, separated from Upper New York Bay by the Narrows strait, 7. Jamaica Bay, and 8. Atlantic Ocean. The river from the Walkway over the Hudson, looking north. Hudson River Facts for Kids. Kiddle Encyclopedia.